Home › Cotton pygmy-goose › Purple heron - Ardea purpurea. The purple heron (Ardea purpurea) belongs to the heron family Ardeidae. The purple heron is a wading bird and is distributed in Africa, Europe, and Asia. There are four recognized subspecies of heron. The subspecies A. p. purpurea occurs in Africa, Kazakhstan and Iran. The subspecies A. p. madagascariensis occurs in Madagascar. The subspecies A. p. manilensis occurs in southeast Asia, Indian Subcontinent, China, Taiwan, Russia and Philippines. The subspecies A. p. bournei occurs in Cape Verde Island. The IUCN (International Union for Conservation of Nature) has categorized and evaluated these heron species and has listed them as of "Least Concern". The purple heron is a large, slender bird, measuring 80 to 90 cm in length and weighing 600 to 1,200 grams. The females is slightly smaller, weighing 500 to 1,100 grams. These heron species have a wingspan of 120 to 150 cm. They have dark reddish-brown plumage, and darker grey back. The bill is narrow and yellow. The crown is black and two lanceolate plumes are present. These birds inhabits shallow freshwater swamps and marsh. They feed on fish, frogs, reptiles, insects and crustaceans. They breed during April and June. 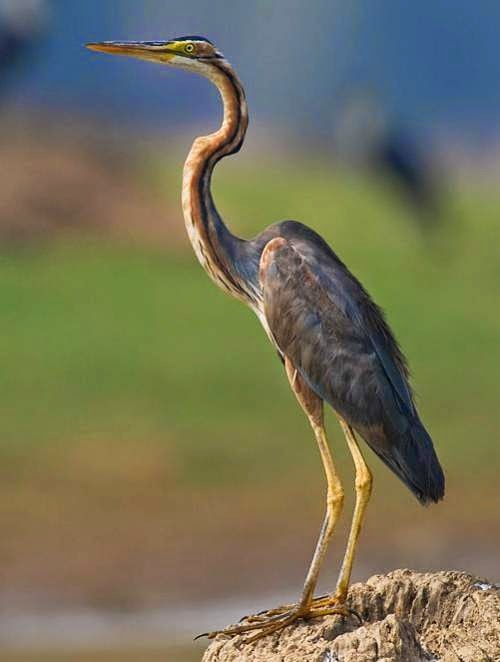 Current topic in Birds of India: Purple heron - Ardea purpurea. Home › Goliath heron › Cotton pygmy-goose - Nettapus coromandelianus. The cotton pygmy goose (Nettapus coromandelianus) belongs to the family Anatidae. 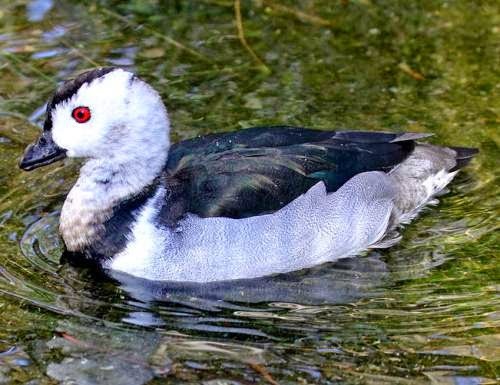 The cotton pygmy goose is distributed in Pakistan, India, Bangladesh, southeast Asia and Australia. There are two recognized subspecies. The subspecies, N. c. coromandelianus occurs in Pakistan, India, Bangladesh, southeast Asia and New Guinea. The subspecies, N. c. albipennis occurs in Australia. The IUCN (International Union for Conservation of Nature) has categorized and evaluated these goose species and has listed them as of "Least Concern". The cotton pygmy goose (N. c. coromandelianus) is a small bird. The males measure 30 to 40 cm in length and weigh 250 to 300 grams. The female birds weigh 180 to 280 grams. The subspecies N. c. albipennis are slightly larger birds. The plumage is predominantly white. Breeding males have a glossy blackish green crown, with white head, neck, and underparts. They have characteristic black collar and white wing-bar. These goose species inhabit still freshwater lakes, lagoons, rain-filled ditches, inundated paddy fields, village tanks and irrigation tanks. They feed on seeds, grasses, aquatic plants, water lilies, insects and crustaceans. These goose species breed during the rainy season. They nest on tree hollows near water. They lay six to ten eggs. Current topic in Birds of India: Cotton pygmy-goose - Nettapus coromandelianus. Home › Knob-billed duck › Goliath heron - Ardea goliath. 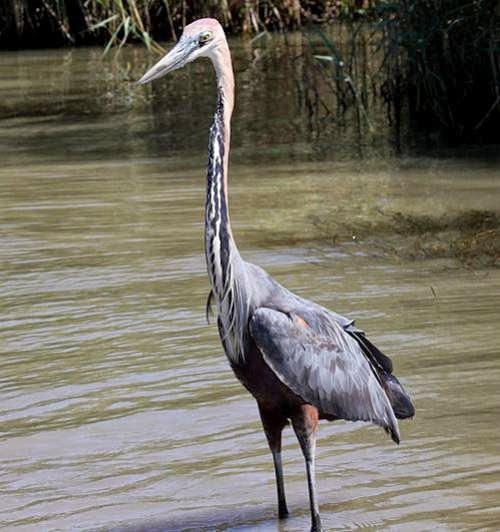 The Goliath heron (Ardea goliath) also known as the giant heron belongs to the family Ardeidae. These heron species are distributed in sub-Saharan Africa, Saudi Arabia, Yemen, Iraq and Iran. Scattered populations occur in Pakistan, India, Bangladesh and Sri Lanka. The IUCN (International Union for Conservation of Nature) has categorized and evaluated these birds and has listed them as of "Least Concern". These birds are world's largest heron species. The height is between 120 to 150 cm. These bird species measure 135 to 150 in length and weigh 4,300 to 5,000 grams. Their wingspan is 210 to 230 cm. The females are smaller and have a shorter bill. The upper part is slate gray. The head, crest and face are chestnut in color. The back and sides of the neck are chestnut. The chin, throat, fore neck and upper breast are white. Black streaks run across the fore neck and upper breast. The eyes and orbital areas are yellow. The upper wing is slate gray and the under wing is chestnut. 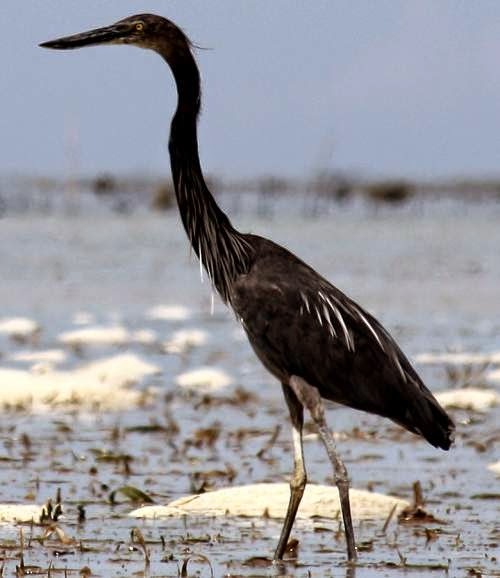 These herons inhabit shallow waters along lakes, rivers, swamps, mangrove wetlands, reefs, and river deltas. They feed on medium sized fish including breams, mullet, tilapia and carp. They also feed on frogs, crustaceans, small mammals, reptiles and insects. They breed during the rainy season. These herons nest on low trees and the nest may have two to five eggs. The parents feed the young by regurgitation in the nest. Current topic in Birds of India: Goliath heron - Ardea goliath. Home › Great-billed heron › Knob-billed duck - Sarkidiornis melanotos. The knob-billed duck (Sarkidiornis melanotos), also known as comb duck belongs to the family Anatidae. The knob-billed duck is distributed in sub-Saharan Africa, Madagascar, Pakistan, India, Indochina and southern China. In South America it is distributed in Paraguay, Brazil and Argentina. There are two subspecies, namely, Sarkidiornis melanotos melanotos and Sarkidiornis melanotos sylvicola. 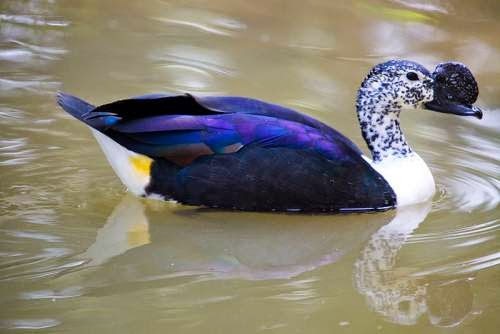 The IUCN (International Union for Conservation of Nature) has categorized and evaluated these duck species and has listed them as of "Least Concern". These knob-billed ducks are large birds, males measuring 65 to 80 cm in length and weighing 1,300 to 2,900 grams. The female birds weigh 1,200 to 2,300 grams. In adults the white head is freckled with dark spots. The neck and the underparts are white. The upper parts are glossy blue black. The secondaries have bluish and greenish iridescence. The males are larger than the females and have a large black knob on the bill. These duck species feed on plant matter, seeds, grasses, shoots, small fish and invertebrates. They inhabit marshes, swamps, rivers, lakes, rice fields and inundated floodplains. These ducks breed during the rainy season. Current topic in Birds of India: Knob-billed duck - Sarkidiornis melanotos. Home › White-winged duck › Great-billed heron - Ardea sumatrana. The great-billed heron (Ardea sumatrana) belongs to the family Ardeidae. The great-billed heron is a wading bird and is distributed in Australia and Southeast Asia. There are two recognized subspecies of these heron. The subspecies A. s. sumatrana occurs in Myanmar, Thailand, Vietnam, Philippines, Indonesia, Papuan Islands, New Guinea and Nicobar Islands of India. The subspecies A. s. mathewsae occurs in coastal Australia. These heron species are large birds, measuring 100 to 115 cm in length and weighing 1,300 to 2,600 grams. They have a wingspan of 190 cm. The plumage is largely dark grey. The heron bill is large, long, sharp and dark. They feed on fish and crustaceans. The great-billed heron inhabit tidal mud flats, coral reefs, mangroves, shallow ponds and banks of large rivers. The breeding season coincides the monsoons. Current topic in Birds of India: Great-billed heron - Ardea sumatrana. Home › White-bellied heron › White-winged duck - Asarcornis scutulata. The white-winged duck (Asarcornis scutulata) belongs to the family Anatidae. 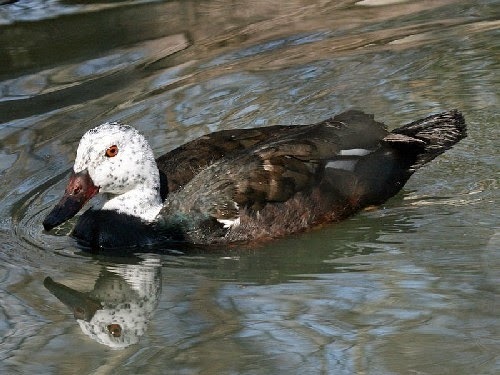 The white-winged duck is distributed in India, Bangladesh, Bhutan, Myanmar, Thailand, Laos, Vietnam, Cambodia and Indonesia. The IUCN (International Union for Conservation of Nature) has categorized and evaluated these duck species and has listed them as "Endangered". These ducks are large birds, males measuring 65 to 80 cm in length and weighing 2,200 to 4,300 grams. The female birds weigh 1,700 to 3,600 grams. These ducks have a whitish mottled head and neck. The body is dark and blackish. The lesser median coverts and inner edges of tertials are whitish and the secondaries are bluish-grey. They feed on seeds, grain, rice, snails, small fish and insects. These ducks inhabit undisturbed, secluded pools and marshes adjacent to evergreen, deciduous or swamp forests. They roost and nest on trees and tree holes. The breeding season extends from April to July. Earlier they were considered as vulnerable. With steep decline in population and habitat loss they are listed as endangered. Current topic in Birds of India: White-winged duck - Asarcornis scutulata. Home › Common shelduck › White-bellied heron - Ardea insignis. The white-bellied heron (Ardea insignis) belongs to the family Ardeidae. The white-bellied heron is distributed in the foothills of Eastern Himalayas, including northeast India, Bhutan and Myanmar. It also occurs in Tibet and Bangladesh. It is believed to have become extinct in Nepal. These herons winter in the Brahmaputra lowlands. The IUCN (International Union for Conservation of Nature) has categorized and evaluated these heron species and has listed them as "Critically Endangered". The white-bellied heron is a large bird with a height of 127 cm. Its wingspan is estimated to be over 200 cm. The back and the long neck are dark grey in color. The belly plumage is whitish. The bill is large and black in color. The legs are also black. The breeding birds have a greyish-whitish nape plume and elongated grey breast feathers with whitish centers. These herons inhabit swamps, marshes, margins of rivers and streams. They may be feeding on fish, frogs and reptiles. 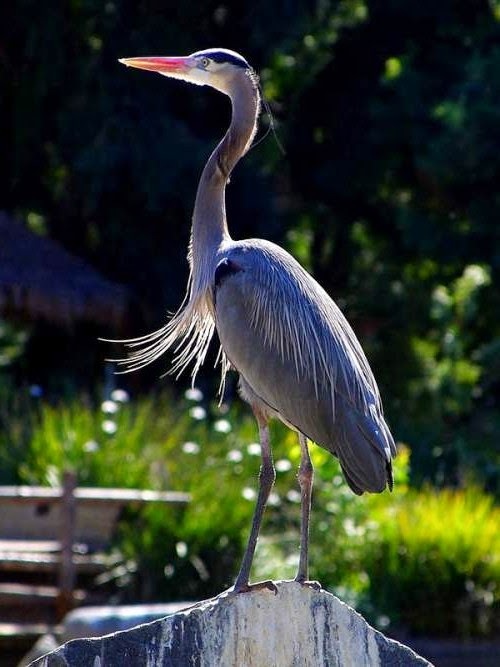 These herons are critically endangered and the population may be between 50 to 249 mature individuals. Current topic in Birds of India: White-bellied heron - Ardea insignis. Home › Grey heron › Common shelduck - Tadorna tadorna. The common shelduck (Tadorna tadorna) belongs to the family Anatidae. 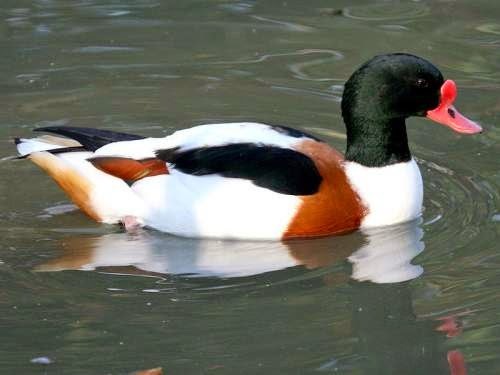 The common shelduck is distributed in Europe and Asia, including Mediterranean countries, Iran, Afghanistan and China. These shelduck winter in Africa, Iraq, Pakistan, India, Bangladesh and South China. They are infrequent visitors to the U.S. and Canada. The IUCN (International Union for Conservation of Nature) has categorized and evaluated these shelduck species and has listed them as of "Least Concern". These shelduck are medium sized and the males are larger than the females. The male bird may measure 55 to 65 cm in length and weigh 800 to 1,500 grams. The females weigh 500 to 1250 grams. They have a wingspan of 110 to 130 cm. These birds have reddish pink bill and pink feet. The body is white and the belly is black. The body has chestnut patches. The head and neck are blackish green. The breeding male carries a prominent reddish knob on the forehead. These shelduck species inhabit lakes, rivers, tidal mudflats and estuaries. They mostly feed on fish, molluscs, insects and crustaceans. The Common shelduck breed during April and May. They are monogamous and nest in burrows, tree holes and haystacks. Current topic in Birds of India: Common shelduck - Tadorna tadorna. Home › Ruddy shelduck › Grey heron - Ardea cinerea. The grey heron (Ardea cinerea), is a wading bird belonging to the family Ardeidae. The grey heron is distributed in Europe, Asia, Indian subcontinent and Africa. There are four recognized subspecies of these herons. The subspecies A. c. cinerea occurs in Europe, Africa, Asia including India and Sri Lanka. The subspecies A. c. jouyi occurs in Myanmar, Southeast Asia and Philippines. The subspecies A. c. firasa occurs in Madagascar. The subspecies A. c. monicae occurs in islands off Mauritania. The heron is a large bird standing up to one meter tall. Its length is 90 to 100 cm and weight is 1,000 to 2,000 grams. It has a wingspan of 175 to 200 cm. Its forehead, crown and throat are white. The plumage of the heron is grey on the back and off-white below. In adult birds a broad black supercilium is found as a broad black eyestripe from above eye to back of crown and extending beyond the neck. The breeding adults have a bright pinkish-yellow bill. These herons inhabit shallow, fresh, brackish or salt, standing or flowing waters. They feed on fish, crustaceans, insects and frogs. In Europe, these herons are getting used to urban life. They breed in colonies on tree tops near water sources. Current topic in Birds of India: Grey heron - Ardea cinerea. Home › Eurasian spoonbill › Ruddy shelduck - Tadorna ferruginea. The ruddy shelduck (Tadorna ferruginea) belongs to the family Anatidae under the order Anseriformes. 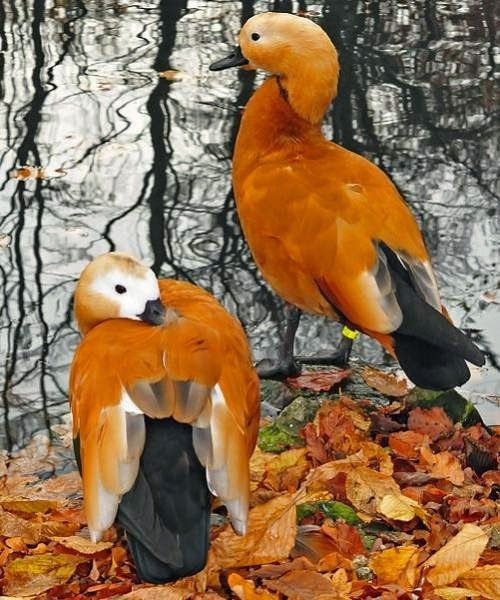 The ruddy shelduck is distributed in Europe, Asia, Indian Subcontinent and a few pockets in Africa. These ducks are migratory birds. They winter in the Indian Subcontinent, South India and Southeast Asia. The IUCN (International Union for Conservation of Nature) has categorized and evaluated these shelduck species and has listed them as of "Least Concern". These shelducks are fairly large birds, the males being larger than the females. The male shelduck measures, 60 to 70 cm in length and weighs 1,200 to 1,600 grams. The female bird weighs 900 to 1,500 grams. They have a wingspan of 120 to 145 cm. The plumage is orange brown and the head is paler. The wings are white with black flight feathers. In breeding season the males have a black ring at the base of the neck. The female bird has white patch on the face. The Ruddy shelducks inhabit large wetlands, salt lakes, crater lakes, rivers with mud flats and shingle banks. They feed on roots, shoots, buds, grasses, leaves, seeds and stems. They breed on cliffs, in burrows, tree holes or crevices. The breeding season is between April and June. The female Ruddy shelduck lays 5 to 15 eggs. Current topic in Birds of India: Ruddy shelduck - Tadorna ferruginea. Home › Red-breasted goose › Eurasian spoonbill - Platalea leucorodia. The Eurasian spoonbill (Platalea leucorodia) is a wading bird belonging to the family, Threskiornithidae. 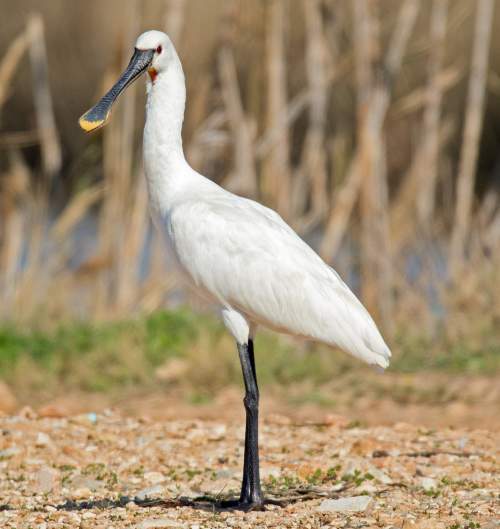 The Eurasian spoonbill is distributed in Europe and Asia. There are three recognized subspecies. The subspecies P. l. leucorodia occurs in Europe and Asia, including Persian Gulf, India and Sri Lanka. These spoonbill winter in Africa and China. The subspecies P. l. balsaci occurs in islands off coast of Mauritania. The subspecies P. l. archeri occurs in coasts of Red Sea and Somalia. 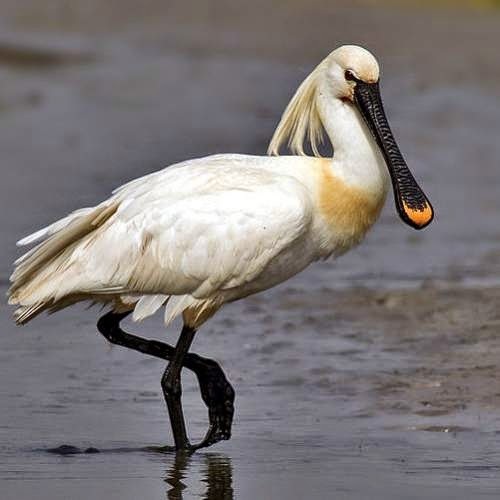 The IUCN (International Union for Conservation of Nature) has categorized and evaluated these spoonbill species and has listed them as of "Least Concern". These species of spoonbill are medium sized birds, measuring 70 to 100 cm in length and weighing 1,100 to 2,000 grams. They have a wingspan of 120 to 140 cm. They have a long spoon-shaped black bill and long blackish legs. In the breeding season the tip of the bill is colored orange-yellow. The Eurasian spoonbill have a crest in the breeding season. The plumage is white with yellow breast patch appears during breeding season. They inhabit shallow, wetlands, marshes, rivers, large water bodies with muddy, clay or fine sandy beds. They feed on insects, small fish, molluscs, crustaceans and frogs. The nest is a platform constructed on the tree or shrub tops. Current topic in Birds of India: Eurasian spoonbill - Platalea leucorodia.